One of the reasons Nestlé has been allowed to pump essentially for free is due to the “reasonable use” doctrine; an old common law doctrine of property with roots in the British Courts of Equity. All uses for which water can be extracted for are considered “reasonable” up to the point that it begins to injure other owners of the aquifer. The doctrines governing over water use has, however, shifted dramatically in the last fifteen years as recent litigation and the signing of the Great Lakes Compact in 2008, an interstate agreement that governs the management of the Great Lakes Basin water supply, have come into play. Moreover, public backlash over the crises in Flint and Detroit, may contribute to stronger political incentives for regulating the commodification of water. 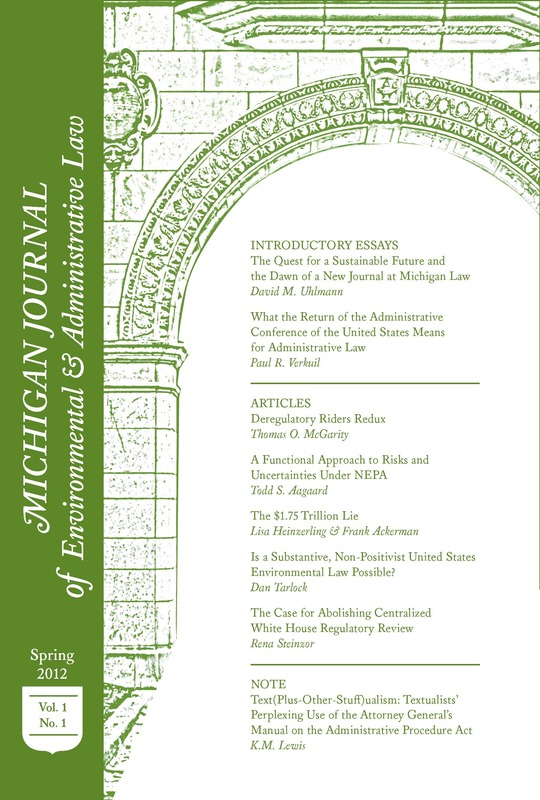 The common law doctrine in Michigan was illustrated most recently in the decade-long lawsuit brought by the grassroots organization, Michigan Citizens for Water Conservation (MCWC), against Nestlé for its violation of the reasonable use doctrine. In 2001, Michigan Department of Environmental Quality (DEQ), the agency regulating the state’s water resources, issued permits to Nestlé to pump up to 400 gallons of water per minute from wells in Mecosta County and Everett County in rural central Michigan. Motivated by a collective concern that the rate of pumping would deplete aquifers and cause significant environmental damage, residents of the area formed MCWC and filed a class action lawsuit against Nestlé. Upon appeal, the appellate court asserted that Nestlé’s water pumping plant, equipment and economic interests were not “inherently unreasonable,” and deserved to have a “fair participation in the common water resources of the area,” even if “plaintiffs might properly be required to suffer some harm.” Rather than employing the strict traditional rule of drawing the line of “reasonableness” at the point where water use begins to harm others, the court instead used a balancing test to determine that Nestlé’s proposed rate of withdrawal unjust for imposing on plaintiffs “the entire burden of harms created by the depletion of…flow while retaining all the benefits.”  The case continued to the Michigan Supreme Court and eventually settled at a pumping rate of 218 gallons per minute. Although seemingly a win for water conservation, the case affirmed a fuzzier definition of “reasonableness,” giving courts the discretion to balance the economic interests of private companies and the harm caused to the environment and human recreation. The legal landscape of water law has become increasingly complexity since the MCWC suit in 2000s. While the reasonable use doctrine may govern water use as it impacts human interests, the Great Lakes Compact, ratified by Michigan in 2005, now governs water withdrawal from an environmental perspective. Although the Compact forbids the export of water from the Great Lakes Basin, it contains a loophole for containers holding less than 5.7 gallons—ostensibly an exception for bottled water to prevent interference with commercial interests. Consequently, in the years since the Compact was ratified, Nestlé has felt little interference from its oversight and rarely has a permit denied. The recent crises of safe water and water affordability in Flint and Detroit may, however, be changing the political landscape. In October of 2016, history began to repeat itself as Nestlé again submitted an application with the DEQ to increase the pump rate on its well near Evart from 250 to 400 gallons per minute—the same rate sought for in the MCWC case. Opposition has been swift. The tiny township of Oscoela denied Nestlé a special land use application to build a booster station, a necessary part of its withdrawal expansion plans. In response, Nestlé has brought a lawsuit against the town of just over a thousand in population, demanding its legal right to build the booster station and ostensibly leveraging its resources to intimidate the township into acquiescence. A judge recently ordered the township to permit Nestlé’s permit request. Nestlé is also facing severe criticism from Native American tribes with treaty rights to the water in dispute—adding yet another legal dimension to the issue. Although the actions of water bottling companies are legally separate from issues of water access, when the commercial successes of companies like Nestle are juxtaposed against the crises of Flint and Detroit, it is clear that there has been a failure to manage water equitably. The problem is not profit, but rather the exploitative methods of achieving it and the way the complex network of water laws prioritize commercial interests over the public welfare. And so, as water continues to become an issue of public concern, there may be an increasing convergence of legal doctrine as these disputes arise at the intersection of property common law, environmental law, Native American law and fundamental human rights. The question for the average citizen is ultimately not which laws apply, but how to find justice in these systems that enable the exemption of private businesses from environmental regulations and shut-off water for families who cannot afford it but, again, exempt commercial entities. The answers are frustratingly complex for a resource that is so basic to human life and welfare. *Jasmine Wang is a Junior Editor on MJEAL. She can be reached via email at yijia@umich.edu. Rejane Frederick, Water as a Human Right: How Philadelphia Is Preventing Shut-Offs and Ensuring Affordability, American Progress (Nov. 8, 2017), https://www.americanprogress.org/issues/poverty/news/2017/11/08/441834/water-human-right-philadelphia-preventing-shut-offs-ensuring-affordability/. Cindy Estrada, Make Detroit Water Affordable, The Detroit News ( July 26, 2017), http://www.detroitnews.com/story/opinion/2017/07/26/detroit-water/104002460/. Flint water crisis: expert says lead levels normal but warns against celebration, The Guardian (Sept. 15, 2017), https://www.theguardian.com/us-news/2017/sep/15/flint-water-crisis-lead-levels-marc-edwards. What has changed, what remains in proposed 30-year Flint water contract, MLive (Nov. 21, 2017) http://www.mlive.com/news/flint/index.ssf/2017/11/what_has_changed_what_remains.html. Laura Gottsdiener, UN Officials Call Detroit’s Massive Water Shutoffs “Human Rights Violation”, Occupy.com (Oct. 21, 2014), http://www.occupy.com/article/un-officials-call-detroit%E2%80%99s-mass-water-shutoffs-human-rights-violation#sthash.4lVxU399.dpbs. Crain’s Detroit Business, By the numbers: The business of bottled water in Michigan, Crain’s Detroit Business (April 1, 2017), http://www.crainsdetroit.com/article/20170401/NEWS/170339973/by-the-numbers-the-business-of-bottled-water-in-michigan. Caroline Winter, Nestlé Makes Billions Bottling Water It Pays Nearly Nothing For, Bloomberg (Sept. 21, 2017), https://www.bloomberg.com/news/features/2017-09-21/nestl-makes-billions-bottling-water-it-pays-nearly-nothing-for. Julia Zorthia, Nestlé Pays Only $200 to Take 130 Million Gallons of Michigan’s Water, Fortune (June 1, 2017), http://fortune.com/2017/06/01/Nestlé-michigan-well-bottled-water/. Michigan Citizens for Water Conservation v. Nestlé Water North America, 709 N.W.2d 174, 298 (Mich. Ct. App. 2005). Great Lakes – St. Lawrence River Basin Sustainable Water Resources Agreement (Great Lakes Compact), December 13, 2005, Great Lakes Compact Council. Mich. Citizens for Water Conservation, 709 N.W.2d at 185 (Mich. Ct. App. 2005). Mich. Comp. Laws, § 324.32730 (2017). Kari Lydersen, Bottled Water at Issue in Great Lakes, The Wash. Post (Sept. 29, 2008), http://www.washingtonpost.com/wp-dyn/content/article/2008/09/28/AR2008092802997.html. Garrett Ellison, DEQ tells Nestle to reevaluate pumping impact on wetlands, MLive (July 27, 2017), http://www.mlive.com/news/index.ssf/2017/07/dew_wants_more_Nestlé_info.html. Michael Gerstein, Judge clears way for nestle booster pump, The Detroit News (Dec. 22, 2017), http://www.detroitnews.com/story/news/local/michigan/2017/12/22/judge-township-must-issue-nestle-pump-station-permit/108840572/. Garrett Ellison, 1836 treaty puts Michigan tribes at center of Nestle water bid, MLive (last updated: June 6, 2017), http://www.mlive.com/news/index.ssf/2017/06/nestle_waters_michigan_tribes.html. Lyda v. City of Detroit (In re City of Detroit), 841 F.3d 684, 702 (6th Cir. 2016).